Field Unit with Communications - performing all irrigation functions, reporting to the IRRInet Control Center (ICC). Stand-Alone Controller - performing all irrigation functions as a stand-alone controller when the system is installed without an IRRInet Control Center (ICC). 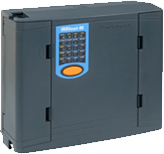 Remote I/O - serving as a distributed I/O for another controller that performs all irrigation functions (applicable when multi-site control synchronization is needed). IRRInet-M an also be ordered as a solar powered unit making remote or unincorporated locations available to the entire system. IRRInet-M is a great choice for landscapes, agriculture, and water distribution systems.Available in both AC and DC models. Today, more than ever, water and irrigation applications depend on reliable control systems and well timed access to information. When absolute control is crucial, you can rely on Motorola's IRRInet control system. As a full featured part of the IRRInet control system, IRRInet-ACE is a modular field unit with a power supply, CPU, and up to eight I/O modules. The modular design allows for greater installation flexibility with support for 3rd party sensors as well as multiple communications options including broadband data over IP, various radio frequencies, cellular and an assortment of wire line options. This level of flexibility makes it suitable for new installations and easily migrates into existing IRRInet systems. IRRInet-ACE can also be ordered as a solar powered unit making remote or unincorporated locations available to the entire system. Using a Piccolo-XR Interface Unit (PIU) connected to an IRRInet-ACEor IRRInet-M, any combination of Piccolo-XRs can be controlled up to 248 inputs and 248 outputs. Basic Dimensions --- H 5.0" X W 4.6" X D 1.63"
If distance or obstructions are a problem, Piccolo-XRs can relay information from unit to unit with a maximum of 3 communications "hops" to reach the IRRInet-ACE or IRRInet-M field controller. Piccolo-XR is perfect for connecting distant landscape points of connection, master valves, flow meters, and booster pumps that are otherwise too difficult or expensive to connect to the local controller at the site. Easy to use screens have a user-friendly layout and intuitive navigational capabilities. Multi-level logins enable the site manager to restrict users to appropriate areas of the software. The Export feature allows reports to be sent to common Windows applications for email and file sharing.Networking - Client/Server architecture is supported allowing you to run your system over the network and operate ICC from remote workstations. Multiple languages are supported, including help files. ICC supports any irrigation basis combination of Time, Time Plus Flow, Quantity, and Depth. The Flow Prediction feature may be used to analyze the demand on the hydraulic system. Cell Phone or PDA text messaging control of all field components, valves, pumps, lights, and more, allows portable system control and testing with communications devices you are already carrying. 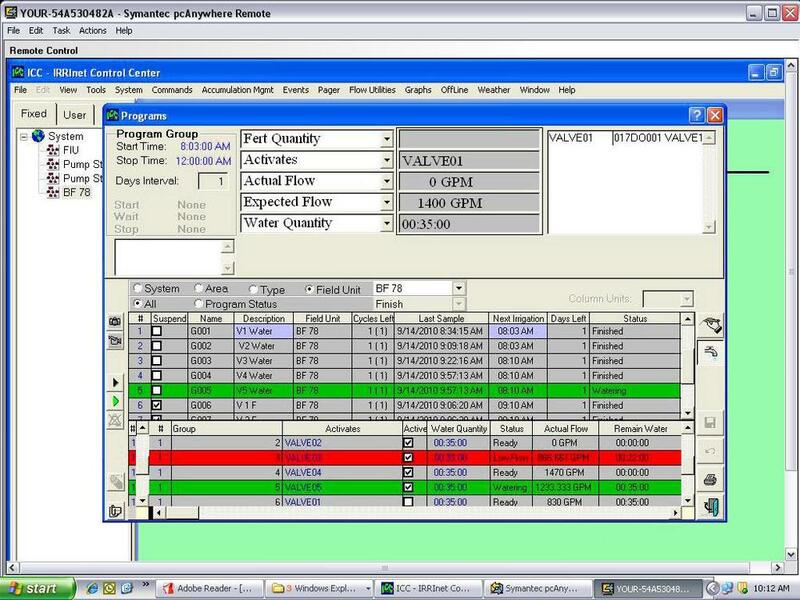 Comprehensive irrigation programming screens are easy to learn and modify.The Network Protection feature enables comparison of flow rates coming from "IN' meters and "OUT" meters throughout the hydraulic system. ICC supports multiple communications methods from the central computer to the local and remote field sites to adjust for distances and changes in topography. Import digital site photos and irrigation design schematics, then click and drag valves, pumps, filters, lights, etc. onto the pictures to create working interactive user screens that operate with the entire system. New employees can learn the system quickly using real site pictures. All ICC functionality is designed for end user adjustment and operation. No outside engineering is required to run your system.